President Akufo-Addo has charged the six contractors working on the six footbridges on the Adenta-Madina Highway to ensure that the constructions works are completed on schedule. 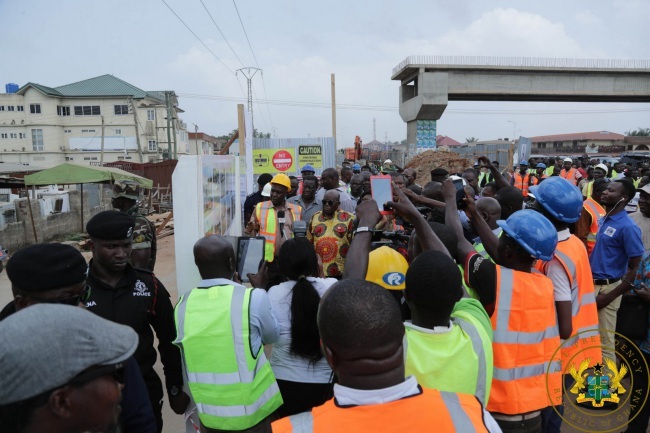 This was after President Akufo-Addo, on Wednesday, 5th December 2018, at the commencement of his 2nd day of his 3-day tour of the Greater Accra Region, paid a visit to the Adenta-Madina highway to inspect ongoing works on the bridges. The President also commissioned the new ultra-modern head office of the Accra Metropolitan Authority, with former mayors of Accra, Nii Amarkai Amarteifio, Nat Nunoo Amarteifio, Solomon Ofei, Stanley Nii Adjiri Blankson, and Alfred Oko Vanderpuije, in attendance. President Akufo-Addo also commissioned a multi-purpose astroturf mini-stadium and community centre at Sukura, in the Ablekuma Central constituency.